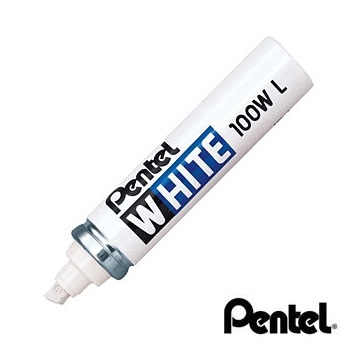 The top white marker on the market... Easy to use stubby marker which writes on virtually anything. Valve controlled quick drying, white opaque ink markers that write on metal, glass, plastic, rubber and most non porous surfaces. Broad Bullet point, 6.5 mm tip white opaque ink marker. Up to 1,300m writing distance. Individual marker on blister card. White china clay pigment ink. 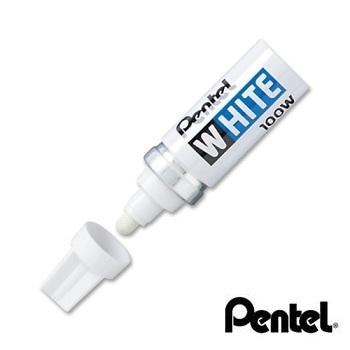 Broad Chisel point, 5.5 mm - 6.5 mm tip white opaque ink marker. Up to 1,300m writing distance. 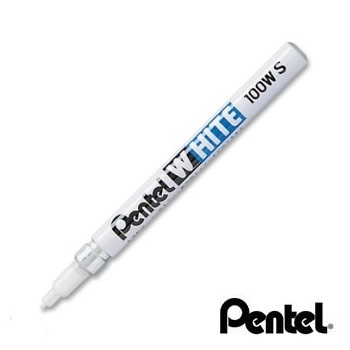 The top white marker on the market... Easy to use marker which writes on virtually anything. Medium Bullet point, 3.9 mm tip white opaque ink marker. Up to 1,300m writing distance. Medium Bullet point, 2.0 mm tip white opaque ink marker. Up to 1,300m writing distance. Specialist medium bullet tip gold and silver pigment indelible markers. ldeal for use on porcelain, glass, metal, wood, plastic, rubber and card. Xylene Free. Quick dry. Water and Fade resistant. Completely Opaque. Medium Bullet tip 2.3 mm line width permanent markers. 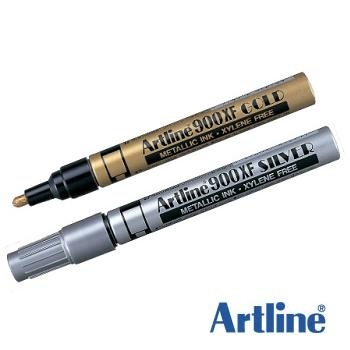 Specialist fine bullet tip gold and silver pigment indelible markers. 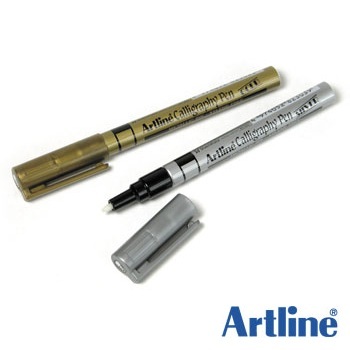 Fine Bullet tip 1.2 mm line width permanent markers. 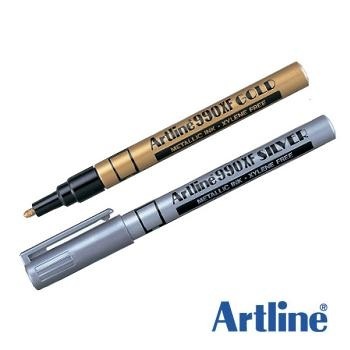 Specialist extra fine bullet tip gold and silver pigment indelible markers. Extra Fine Bullet tip 0.8 mm line width permanent markers. Specialist calligraphy marker pens for elegant, classical and characteristic handwriting. ldeal for decorating, illustrating and writing on card, glass, metal, wood, plastic or pottery. Elegant Calligraphy tip 2.5 mm line width permanent markers.